A report, published by the Texas Transportation Institute (TTS), finds that cell phone use - not drinking - is spurring the increase of nighttime car crashes involving teenagers. Nighttime crash fatalities have increased for drivers of all ages and for teen drivers in particular. The number of teen fatalities involving alcohol has decreased slightly, leading researchers to speculate that cell phone use is the culprit in increased nighttime crash fatalities. As some of you may have heard, there has been an issue with some cell phone violations being thrown out because of an oversight by the Department of Licensing (DOL) and their updating of (or lack there of) Washington's Model Traffic Ordinance (MTO). The entire issue is explained in DOL's Blog, or read the text below. DOL is contacting local governments Friday to detail a reimbursement process for refunds to drivers who paid fines for cell phone and texting violations and some other traffic offenses. Out of about three million traffic tickets written since 2007, the agency estimates just under 10,000 may be eligible for a refund. The MTO is a traffic law rulebook that cities and counties can adopt to easily be consistent with state traffic laws. DOL is responsible for updating the MTO rules as new laws emerge. On June 30, DOL discovered that municipal court judges in several jurisdictions were dismissing cell phone and texting tickets because the MTO had not been updated to reflect these violations. Further study revealed the MTO had not been updated since 2004 and several other new laws passed since then also were not included. This issue does not affect citations issued by the Washington State Patrol, other state police agencies and a number of city and county governments. It also does not affect any cell phone-related tickets issued on or after July 1, 2010, or those for any other affected laws after July 19, 2010, as the entire rulebook is now updated. Individuals who were issued a citation and paid a fine should go to the court in the jurisdiction which issued the citation to request reimbursement. DOL will then reimburse these local courts for the amount of the fine, which is typically $124. The agency estimates that reimbursements could total up to $1.2 million statewide for tickets written during the past three years. The funds will come from within the agency’s budget by deferring planned equipment replacements, printing and mailing savings associated with new email renewal notices, and some savings accumulated by continuing to not fill vacant staff positions. The following jurisdictions already have been identified as not being affected by the MTO issue: Washington State Patrol and other state police agencies (regardless where issued), Seattle, Tacoma, Bellevue, Lynnwood, Prosser, Yakima, Yakima County, Snohomish County, Thurston County, Mason County, Skagit County, Kittitas County and Spokane Municipal prior to 1/1/2009. Driving is just not very much “fun” anymore. The fact that I’ve personally been in the right place at the wrong time, to witness three major highway events, in the past several months, has convinced me of this. I doubt there are many of us anymore who remember taking a Sunday afternoon “drive” just for the fun of it. Three dollars a gallon (or more) for gasoline, has irrevocably changed our driving habits. Even with the increased costs, weekday traffic is increasing, and with the increase comes increased risk for collisions. Both highway and automotive engineers are working to make driving safer, but they can only go so far – the ultimate responsibility falls to the driver, to be aware of what is going on around you. Getting the big picture of all the traffic around you, and planning your potential “escape route” is an invaluable tool for every driver. I started to brake, to reduce my speed and prevent me from being on the outside of the truck and then watched as the “inside” tires on the trailer started to raise off the road way, slowly at first, and then with increasing speed, as the trailer and excavator rolled over onto its left side. The tractor stayed upright, but not before it too, had attained about a 30 degree angle before the 5th-wheel assembly separated from the overturning trailer. When the dust (literally) settled, the excavator was on its side, the trailer was upside down, and the tractor, while still upright, was facing the opposite direction from its original path. The off ramp was completely blocked for the remainder of the afternoon commute. I believe this event only again proves the effectiveness of getting the big picture: what type of vehicles are on the road, near you, where are they in relation to your vehicle, is the configuration of the roadway presenting a hazard of its own? All of these factors played a role in the event I’ve described, and I truly believe getting the big picture, and taking timely action, prevented me from being under that tipping load. 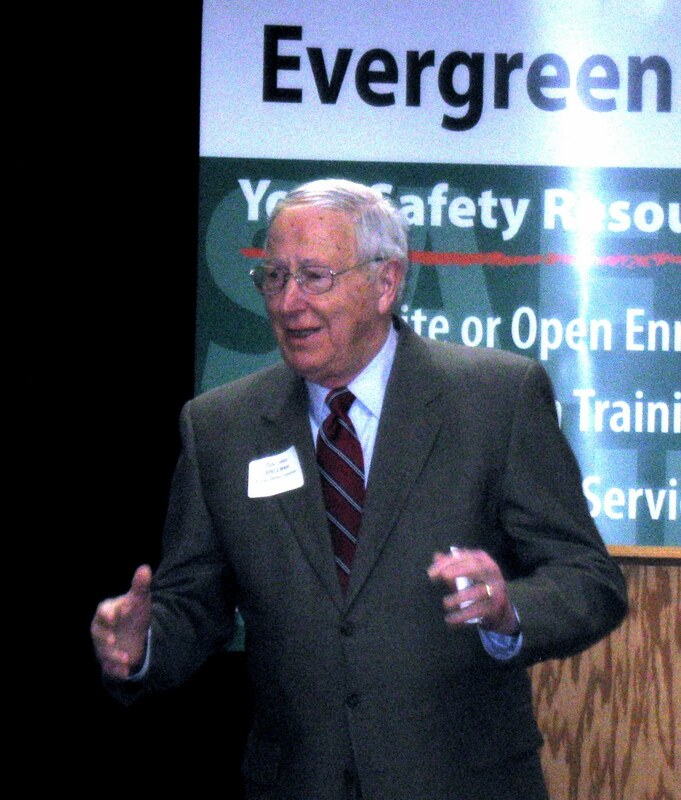 If you would like to learn more about safe driving, check out the variety of driver training options offered by Evergreen Safety Council, let’s keep the big picture in view as we drive. In honor of tomorrow being National Drive-Thru Day we are providing the link to Safety Norm's blog post about Drive-Thru Distractions. If you celebrate the "holiday" remember, after you order: park, enjoy your meal and then drive. Do you need to be an effec­tive train­er, pre­sen­ter or facil­i­ta­tor? I do not like standing up in front of a crowd, but seated at a table I can present my ideas just fine. Why is that? I know lots of people on both sides of the “speaker” spectrum, and they all say/need the same thing: practice, practice, practice. Are you a sub­ject mat­ter expert who needs to share your knowledge with management or staff? This course will help you develop skills as a facil­i­ta­tor to run effec­tive and pro­duc­tive meet­ings – even in highly charged conditions. This workshop allows participant to practice a variety of presentation styles, and includes critiquing presentation effectiveness and style. Class size is limited to allow for group participation, and space is still available. The next class is Thursday, July 29th – Register today! This course is part of ESC’s Safety & Health Specialist certification program, which is designed to provide participants with a solid foundation of knowledge in safety-related skills and activities. Each participant learns the state and federal health and safety regulations affecting all organizations. Successful completion of the entire training series prepares the participant to perform basic safety and health duties for the employer with confidence. The SHS program consists of 22 safety and health topics, taught in 15 training sessions. Each session is one day in length, covering one or two subjects. Classes are open to everyone without prerequisites or commitment to the total program. You can simply attend the classes that interest you, or complete the entire series to be certified as a Safety and Health Specialist. Construction employees working on highway/road construction work zones often risk being struck by traffic. Do the OSHA standards require high-visibility apparel for these construction workers? Road and construction traffic poses an obvious and well-recognized hazard to highway/road construction work zones employees. OSHA standards require such employees to wear high visibility garments in two specific circumstances: when they work as flaggers and when they are exposed to public vehicular traffic in the vicinity of excavations. However, other construction workers in highway/road c construction work zones are also exposed to the danger of being struck by the vehicles operating near them. For such workers, section 5(a)(1) of the OSH Act, 29 U.S.C. 654(a)(1), also know as the General Duty Clause, requires similar protection. Section 5(a)(1) requires employers to provide their employees: ….employment and place of employment which are free from recognized hazards that are causing or are likely to cause death or serious physical harm to his his/her employees….. The Federal Highway Administration (FHWA) rationale underlying the rule well illustrates that the industry recognizes that construction workers in highway/road construction work zones need protection against the hazard posed by moving traffic. The FHWA’s recent mandatory standard for workers on federal-aid highways shows that struck-by hazards in highway/road construction work zones are well recognized by the construction industry. Furthermore, the standard indicates that a feasible means of addressing that hazard is the wearing of high-visibility apparel. Accordingly, high-visibility apparel is required under the General Duty Clause to protect employees exposed to the danger of being struck by public and construction traffic while working in highway/road construction work zones. Typically, workers in a highway/road work zone are exposed that hazard most of the time. The fines can start at $7000. per ticket, so if you have several workers on foot in the work zone without high-visibility apparel you can multiply the fine by that number of employees that are not wearing it. We enjoy watching birds. In the spring, the birds appear especially hungry, probably, we surmise because they are not only hungry from the smaller food supply available during the winter, but because they are working hard on building their nests in preparation for the raising of this season’s offspring. One Robin in particular was busy building a nest in a sheltered area of the garage. I noticed that at times the Robin would come to the window of my work shop, perch on the window sill, ruffle up its feathers, chirp loudly and then attack the window. Our bird books tell us that Robins are territorial, they will drive out any competition in the area of their nests; this bird apparently thought the reflection in the window was a competitor and tried to drive it away. The perceived threat was not real, it was only an illusion. Often, in the world of safety we too become influenced by an illusion – the illusion that there are no safety issues. 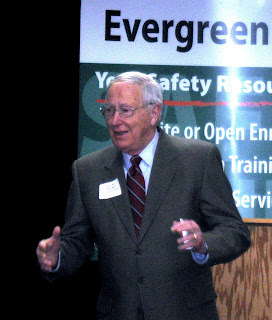 While the workmen’s compensation rates do vary with the type of work being performed – no one would argue that the risk of an injury are greater when working in the logging industry or construction than if working in a business office - the rate per hour is proportionately less for officer work than for logging, construction or other outdoor activities. The rate structure shows us two things: some jobs are more hazardous, and there is no job without some level of hazard associated with it. In Washington State, WAC 296-800-110 gives the basic rule that an employer must provide a workplace free from recognized hazards, and provide and use means to make your workplace safe. Do you know how to perform a safety evaluation of your workplace? Are you familiar with the laws and codes that affect the working environment in your business? Do you have a written accident prevention plan, or emergency procedures manual for your employees? If you have concerns about identifying hazards in your workplace, contact ESC to have one of our experienced safety consultants make a visit to your site and provide you with their observations and recommendations for improving safety in your workplace. Every morning and evening during my commute I fear for my life! Each day we travel to our jobs, some people always travel to the same location, some to varied locations in a week. Some of our jobs are considered high risk (dangerous), some are lower risk. For over 20 years my job was to direct traffic through work zones. You would think all of the crazy drivers I have witnessed would prepare me for my commute, not a chance. I am more fearful during my commute then when standing on the road directing traffic. At least I can see what is coming at me when I am directing traffic. When commuting you have to worry about what may appear out of no-where, or cut me off, or force me to speed to change lanes to get out-of-the-way. Just this morning: 24 out of the 30 vehicles (both company and private) that I counted were going 65mph to 70mph. I wonder if the employers of these “professional” drivers realize that this type of driving behavior is occurring. These speeders are cutting in front of vehicles, switching lanes, tailgating, merging over the solid white lines and passing on the right just to get a few more feet down the road (me-first mentality),and then having to slam on their brakes. Why? I can only guess that these types of drivers have never been involved in a serious injury crash or perhaps have never lost someone to a fatal crash. The fact of the matter is, no matter how high or low risk the job is, a lot of us still have to commute to or for them. Motor vehicle crashes continue to be the number one cause of work related fatalities year after year. The most common day of the week for crashes, Wednesday and Thursday. The most common day of the week for fatal crashes is Friday and Saturday evenings. The most common time of the day for crashes is during the work week afternoon rush hour 2 – 7 pm. The most common weather conditions are clear and sunny days. Visit the Evergreen Safety Council’s website for additional information on driver safety classes and events, as well as other worker place safety training options, and consider having your teen drivers attend Ford’s Driving Skills for Life which is free to all drivers. Fords’ event will be August, but you must register soon. Don’t let you or your family or workers become a crash statistic 2010. Police departments in King County will inundate area roads, highways, and interstates with extra police patrols targeting speeding drivers beginning Friday, July 16 and continuing through August 1 as part of the statewide “Slow down or pay up” campaign. The campaign’s goal is to eliminate deaths and serious injuries from traffic crashes in Washington by the year 2030. "Speeding may seem like a quick and effective shortcut, but in fact it is a leading cause of traffic deaths and injuries in King County and Washington State," said Dr. David Fleming, Director and Health Officer for Public Health - Seattle & King County. "Speed-related crashes harm individuals, families, and communities, and many people hurt in these crashes suffer life altering trauma and never recover fully." The emphasis patrols over the next month are a key component of the Strategic Highway Safety Plan: Target Zero. The vision of Target Zero is zero deaths and serious injuries from traffic crashes in Washington by the year 2030. The Washington Traffic Safety Commission funds the extra patrols. According to the Washington Traffic Safety Commission, from 2006 – 2008, speeding drivers killed 140 people in King County crashes, an average of four deaths a month. These speeding-involved crashes accounted for 44% of traffic deaths in King County for that period. The following police agencies in King County will conduct “Slow down or pay up” patrols: Auburn, Bellevue, Black Diamond, Burien, Des Moines, Federal Way, Issaquah, Kent, Kirkland, Maple Valley, Mercer Island, Newcastle, Normandy Park, North Bend, Pacific, Redmond, Renton, Sammamish, SeaTac, Seattle, Snoqualmie, Tukwila, and the Washington State Patrol District 2. Public Health- Seattle & King County chairs and staffs the King County Target Zero Task Force (previously known as the King County Traffic Safety Coalition). Members include representatives from a variety of King County law enforcement agencies, the Washington State Liquor Control Board, alcohol and drug prevention organizations, traffic engineers, non-profit organizations, and others. The Washington State Traffic Safety Commission provides funding for the coalition and other King County traffic safety activities. Providing effective and innovative health and disease prevention services for over 1.9 million residents and visitors of King County, Public Health – Seattle & King County works for safer and healthier communities for everyone, every day. The overall document is about 13 pages and if you would like to read the entire bulletin, which is a good idea, it can be found at the following link. One other point of interest is that the Chemical Safety Board has some very good information and investigation information from massive explosions which have happened in the US. As most of you know, car crashes are the leading cause of death and injury for teens. With that in mind the Washington Traffic Safety Commission is assisting the Governor's Highway Safety Association (GHSA) and Ford with a FREE event on August 18 and 19 at Emerald Downs in Auburn, DRIVING SKILLS FOR LIFE. Teens, parents, educators, and anyone interested in teen driving safety will be provided an rare opportunity to drive a unique skill-building course designed to go beyond and build on traditional traffic safety education. Watch the OVERVIEW VIDEO! Registration is online (scroll to the bottom for Seattle dates). There are 400 slots available over the two days. Session 1: 8:00 a.m. to 12:00 p.m. Session 2: 12:30 p.m. to 4:30 p.m.
Ford and the GHSA need our help in spreading the word about this event. Feel free to forward this invitation to friends & family, put in on your Facebook page, link it to your website--whatever you can do to make sure everyone has a chance to be part of this unique training for teens and those who care about them. An online edition of a major newspaper recent cited a study they stated was conducted by NHTSA claiming, “80% of all car accidents and 65% of near misses are caused by distracted drivers more focused on their burgers than the road.” A claim that a single source is a cause of 4 of 5 – of any kind of event – bears further investigation. Perhaps one of you kind readers can find this study, but after a frustrating session searching the NHTSA, and other government sponsored websites, I simply couldn’t find the study referenced. Though, the time spent was not without its reward; following are some valid points, regarding our driving distractions. Distracted driving is any non-driving activity a person engages in that has the potential to distract him or her from the primary task of driving and increase the risk of crashing. Cognitive: taking your mind off what you are doing – safely driving your vehicle. Use a mobile phone or texting, or programming a navigation device involves all three! But, that’s a topic for another post. Regarding eating and drinking while driving; let’s examine how each of the categories is involved. Food looks GOOD. All of us enjoy the pleasure and appeal of our favorite foods. Some foods are really hard to resist, and being hungry doesn’t help. This is definitely a visual distraction. If your vehicle is equipped with cup holders or a tray or bin of some sort, where you can place the ‘burger, bag of ‘fries or whatever; you need to look for it again to firmly grasp it, so you spill it while attempting to take another bite. Add to that the necessity of un-wrapping the typical fare from a drive-through window and your attention is further held on the task – NOT the task of driving. Definitely a manual distraction. If your vehicle is equipped with a manual transmission, the task of shifting requires at least one hand on the shift lever. Now if you also want to adjust the radio or CD player, take a drink of that soda or cup of coffee, while attempting to locate that “run-away” French fry that is somewhere on your car seat . . . well that rivals the best of circus juggling acts. Most of us enjoy eating. It tastes good, it smells good, the texture of the food is pleasing to the palette. Part of that enjoyment comes from our mental attention to these physical stimuli. Add to this the typical random thoughts about work, home, the economy, whether the rain will hurt the rhubarb, and it’s a wonder that any part of our conscious thought is left over to deal with the act of guiding a ton of steel down the roadway with who knows how many other drivers that are equally as distracted? Lastly, think about the food you typically can obtain at a drive-through window: much of it is slippery. Condiments tend to drip out of sandwiches, dill pickles are accomplished escape artists, and tacos are the only food I know of that is designed to disassemble itself just by raising it to your mouth. Take a tip from your friends at ESC: driving requires your full attention, don’t make the task even harder by limiting the amount of your concentration that is devoted to driving by attempting to eat, drink, and drive. This was first purposed in 2006 and is intended to fill the gap; there are very few OSHA or ANSI standards that address road or highway construction. This A10.47 ANSI standard is one of few that cover vertically in one industry. For more information on this new ANSI A10.47, go to The Work Zone Safety Clearing house at www.workzonesafety.org click on video vault to view this webinar; it runs about 44 minutes, it is free and it gives a great overview on this new ANSI Standard. Description: Learn the basics of the Apollo Root Cause Analysis method including how the four steps of Apollo RCA are applied using example problems, learn how the standard "off the shelf" RCA practices like the 5-Why's and Fishbone are inadequate and find out why Apollo RCA is superior in terms of creating a more complete understanding of the problem, uncovering more causes, and creating more solution opportunities. The King, Snohomish, and Pierce County Target Zero Teams (TZT) held their kick-off event at Boeing Field this morning. King County Target Zero Team member, Trooper Dan McDonald had just departed the event when he came upon an impaired driver travelling 84 MPH on Interstate 5 in Tukwila. I'm sure this will be on the evening news tonight, as this driver was not only impaired, but was endangering everyone else that was on the road, near him. Drunk driving is not a joke, and law enforcement in our state is taking major and effective steps this summer to apprehend the small number of drivers who think they're a special case, and are able to drive even after drinking. The simple truth is, even one drink will affect your abilities to react in an emergency situation, and at least will seriously slow your reaction time. Don't become a statistic; call a cab, or have someone in your group be the designated driver. None of us want to see you on the evening news . . . in handcuffs.